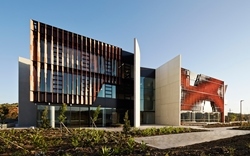 Nan Tien Institute and Cultural Centre is a new tertiary educational facility and multicultural art galley based in Woolongong N.S.W. This unique construction features custom designed & specialist manufactured curved pre-cast panels. The white light concrete deserved enduring protection both during construction and post handover to the client. SA Precast used Hydron Barricade Anti Graffiti due to its ability to protect the surface from environmental damage as well as graffiti, while still preserving the natural aesthetic of the concrete. Hydron Barricade’s water based technology & low VOC was an important environmental consideration for this project. ‘At SA Precast we enjoy a challenging and difficult job and Nan-Tien was certainly that. Just about every panel was a different shape and curve radius . The manufacturing involved a lot of complex mould making. Each of these panel moulds has an off-sawn oregon timber finish that required laying and shaping by hand. The handling and transportation was also challenging due to the shape of each individual panel. We used Barricade to protect the panels and found it easy to apply in-house with our airless sprayer. The finished job looks great and we are proud of all of our hard work’.